Low-angle but fun, the climb goes right on face to avoid the roof. You can rap from the tree with two ropes, or walk off around Ragged Edges in only a few minutes. Which SuperTopo guidebooks include a topo for Tonto? 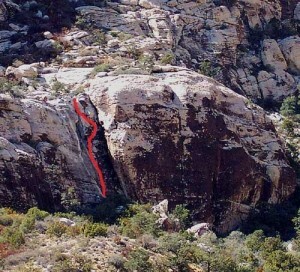 The Ragged Edges area in Willow Spring is the most accessible crag in the main canyons at Red Rocks.